India’s Prime Minister, Modi, came here not too long ago and was hugely popular. That has changed now the high caste owned media allied with the high caste politicians is blaming India for the blockade. Modi was popular because he kept getting out of his car to talk with ordinary Nepalis. Politicians don’t do that. He was popular, too, because he said India would make big investments in Nepal to stimulate its economy. He said that was in India’s best interest as well as Nepal’s. Increased trade between them would be good for everyone. In particular, he promised massive investment in hydro power generation. India would buy some of the electricity. Much of it would be for Nepalis. An engineer friend of Nagendra’s who works for the electricity company told him why that will never happen. 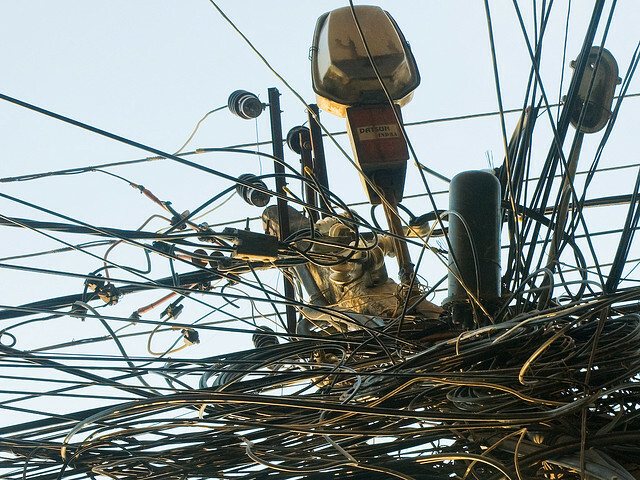 A new higher capacity distribution network would be necessary. It would also, by the way, be good to upgrade the “last mile” part of the grid that looks like this, but that could wait. The higher capacity transmission lines would need new towers. Each of them would need a small parcel of land and buying that land is why the network can’t be built. Payoffs for every parcel to leaders of the three major political parties and each local party would make the venture cost-prohibitive. Can’t the legal system be used to overcome such corruption? I hoped the new Constitution would restructure the judiciary to be independent. I should have known better. If the judiciary was not controlled by the politicians, they would risk prosecution for corruption. Democracy is impossible in a society like this. Everyone knows the politicians’ promises are empty. The culture overall, not just in the political sphere, is to tell you what you want to hear so you will be happy. You will not be happy when it doesn’t happen, but you never really counted on the promise, anyway. The security guard for the bank beside Nagendra’s shop who is Tamang like Doma’s family explained how he voted in the last election. The Congress Party promised 3,000 rupees for his vote. He was going to vote for them, but then the Maoist Party promised 5,000. Neither of them would do what they promised if elected so he went with the higher price. Kathmandu was a paradise when Nagendra moved here in 1980. He got his drinking water from the Bagmati River. The result of ongoing failure of government? It is now a sewer. 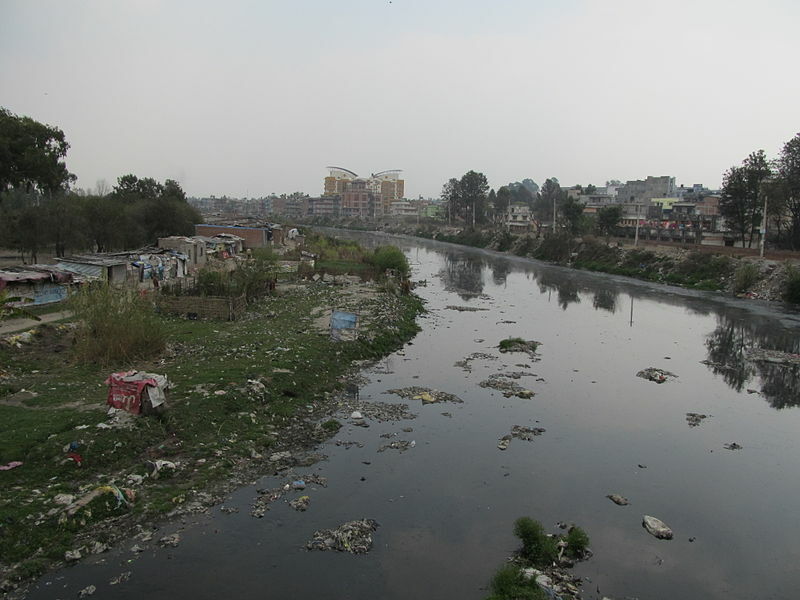 Kathmandu’s population is now over a million yet fully 95% of its waste water is untreated and is dumped directly into rivers. Garbage collection is an equally sorry story. Much of it is disposed of haphazardly along the river banks. That also ends up in the water. This afternoon the three kids and I will cross the bridge where that picture was taken and move back to Doma’s mom’s rooms. She doesn’t like to but maybe she will have to cook with wood on the roof. Doma’s aunt enjoys doing that and wants us to stay but we’ve been burdening her long enough.